The multiple Academy Award winner Miklós Rózsa and Colosseum Music Entertainment go way back. 1953 to be exact. That’s the year when Rózsa came to Nuremberg to record his original composition to the film Quo Vadis (1951) with the Nuremberg Symphony Orchestra for the world’s first-ever film music release on vinyl. This was followed by Vincent van Gogh – Lust for Life (1956), Ben- Hur (1959), El Cid (1961) and the final recording The Needle (1981). In 1982, Rózsa’s colleague Elmer Bernstein recorded a comprehensive retrospective in Nuremberg as a “birthday present” for his dear friend. That’s the album in our special offers titled “Miklós Rózsa – Classic Film Music” and includes excerpts from “El Cid”, “Quo Vadis”, “The Lost Weekend”, “Plymouth Adventure”, “The Private Life of Sherlock Holmes”, “Ben-Hur”, “The Strange Love of Martha Ivers”, “King of Kings” and “Dead Men Don’t Wear Plaid”. 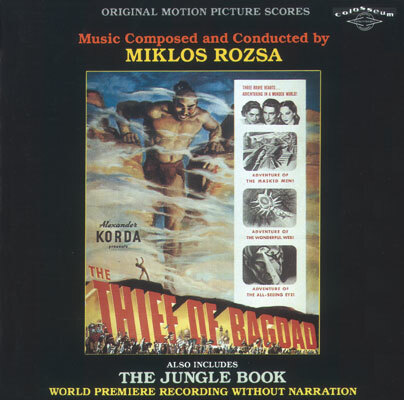 In the same year Rózsa conducted for the last time for a re-recording of “The Thief of Bagdad”, also in Nuremberg, whereas his suite for “The Jungle Book” had been recorded in the previous year, 1981, with the Nuremberg Symphony Orchestra under the direction of German conductor Klauspeter Seibel. These two recordings are available on this CD.